Many people wish they could sit down at the piano and simply play, their hands flying over the keys as melodies pour out. With this simple, achievable program that's possible…in just six weeks. Using innovative chord playing techniques; anyone can quickly and easily gain skills. 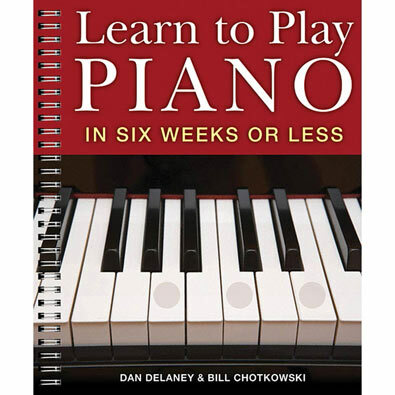 Each of the six weeks' worth of lessons contains several exercises and includes sheet music, practice advice and an evaluation at the end. 128 pages. Spiral bound. Soft cover. 8" x 10". Be a hit at your next party with this retro piano tie that actually plays notes. Touch sensitive polyester fabric plays eight notes with a plastic speaker in the knot at the neck. Adjustable cord with magnetic closure fits any size. On-off switch. Requires two AG 13 button batteries, not included. 18-1/2" long. Turn any surface into an instant piano with the electronic piano gloves. Each fingertip plays a different note and has it's own built in speaker. Contains 8 instrument tones, 20 background rhythms, six pre-recorded songs, demo mode and volume and tempo controls. Requires 4 AAA batteries, not included. Controller measures 3-1/2" in diameter, cable length is 37-1/2". Gloves fit most sizes. Instructions included.